Disney Visa Cardholders can book Food and Wine Festival events starting at 7 a.m. on July 28! That means for two days, on Tuesday, July 28 and Wednesday, July 29, Cardmembers will enjoy an advanced booking opportunity for festival events before sales open to the general public. In addition, Disney Visa Cardholders are being offered three exclusive Festival events this year: Brews, Breakfast and More; Making of the Party for the Senses; and Creation of the Food and Wine Marketplaces. 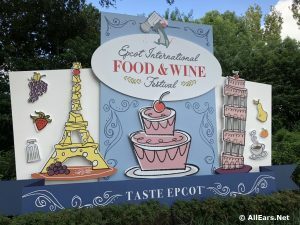 Here are the menus, with prices, from the 30+ International Marketplaces found around World Showcase in Epcot during the 20th Annual Epcot Food and Wine Festival. A selection of photos from the Tables in Wonderland sneak preview of the 2015 Epcot International Food and Wine Festival. New for the 2015 Epcot International Food and Wine Festival is Remy’s Ratatouille Hide & Squeak, an interactive game in which you can help Remy, the little chef, as he searches around World Showcase at Epcot collecting ingredients for his signature dish, Ratatouille. Maps and stickers for this scavenger hunt can be purchased for $9.95, … Continue reading "2015 Epcot International Food & Wine Festival September 25- November 16, 2015 Remy’s Ratatouille Hide and Squeak"
The Food and Wine Festival Discovery Sampler Package is new for the festival this year. Discover tastes from the International marketplaces and take in the sounds at an Eat to the Beat concert. Choose from more than 150 different menu items with an entitlement credential that allows you to Taste Your Way Around the World. 2017 Epcot Food and Wine Festival General Info Global Marketplaces Special Ticketed Events Culinary Demos/ Beverage Seminars/ Mix It Make It! Eat to the Beat Concerts/ Dinner Package Tasting Sampler Package The Chew at the Festival AllEars.Net Reports The Chew Taping REVIEW: Tequila Lunch REVIEW: Behind the Scenes at Trader Sam’s REVIEW: Jiko Signature Dinner … Continue reading "Epcot Food and Wine Festival Archive"
The Epcot International Food and Wine Festival returns to Walt Disney World Resort this fall with 75 days of entertainment, events, and, of course, a veritable cornucopia of wonderful food and tasty beverages. The festival&apos;s 23rd year runs from August 30 to November 12, 2018. This year&apos;s festival will continue its tradition of fine dining events, appearances by favorite Disney culinarians and top celebrity chefs, and a slate of concerts from favorite bands of the last few decades.